Every year I think that this will be the year I finally teach my kids to cook. The problem is that after teaching language arts, math, science, and history I’m tired. I just want to get dinner on the table as quickly as possible – which means without kids in the kitchen. Realistically I need help. 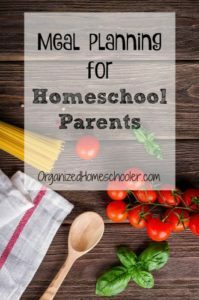 I need help teaching my kids to prepare meals so that they can help me get lunch and dinner on the table. 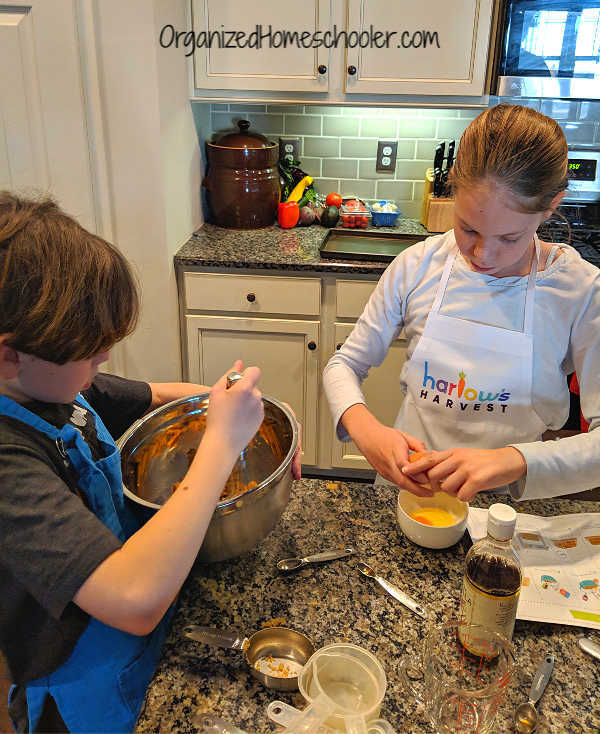 I recently partnered with Harlow’s Harvest to teach my kids to cook. Learning to cook is one of those important life skills that everyone needs. We eat multiple times per day, every single day, every day of our lives. We need to teach our kids to cook so that they can be one day live independently and not rely on fast food or the freezer section of the grocery store. Kids that know how to cook can be a huge help! Once they are comfortable in the kitchen, they can take over some of the meal prep and cooking for the family. 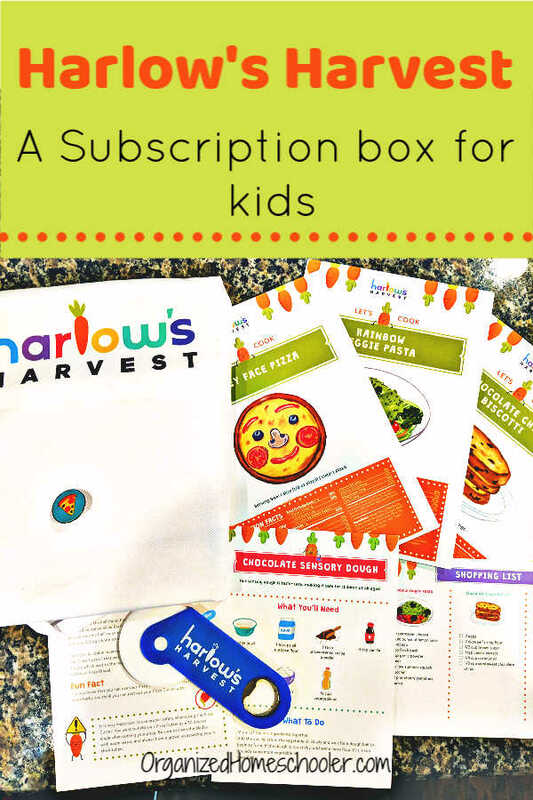 Harlow’s Harvest is a subscription box for kids that teaches kids to cook. A new cooking kit arrives each month. It is intended for kids between the ages of 4 and 15. I’m always skeptical of such a large age range, but I truly think 4-15 is accurate. My kids are 10 and 13. They were able to follow all of the cooking instructions with minimal help from me. Younger children would have no problem following the picture cues with parental support. Want to try Harlow’s Harvest? Read further for a chance to win a free kit! The first step of any cooking program is to gather the ingredients, so I took my kids shopping. Despite feeling like I live at the grocery store some weeks, I rarely take my children. They are old enough to stay home while I run to the store and I generally prefer shopping in peace. However, that isn’t helping them learn how to grocery shop. It is hard to learn to cook if you can’t find the ingredients in the store. They brought along the provided shopping list to make sure we didn’t forget anything. Before heading to the store we looked through our pantry and we crossed out the items that we already had on hand. We bought the ingredients to make chocolate chip biscotti, smiley face pizza, and rainbow veggie pasta. I let Hannah and Ben choose which recipe to make first. It was no surprise at all that they chose to start with the chocolate chip biscotti. Who can turn down chocolate?! 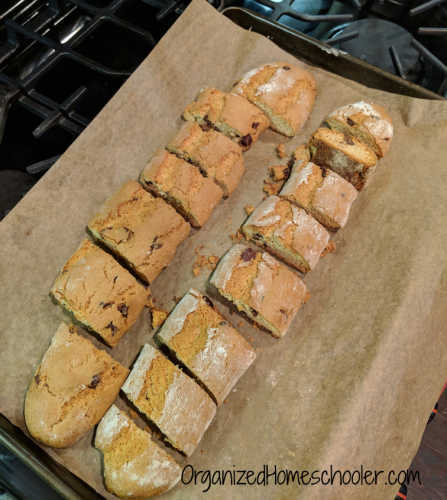 After dinner one night they worked together to whip up a batch of homemade biscotti. I helped them gather the ingredients and set the oven to the correct temperature, but then I just sat back and watched. 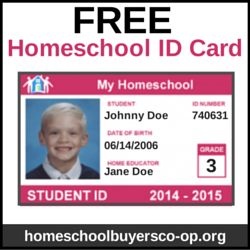 They were able to easily follow the instruction card without any help at all. I just sat at the counter and observed. They were so proud that they had made homemade chocolate chip biscotti completely from scratch all on their own. Another day the kids decided to attempt making the smiley face pizza for lunch. I have a gluten allergy and never cook with wheat flour or yeast, so this was a fun project for my kids. They really had no idea how pizza dough was created before this activity. 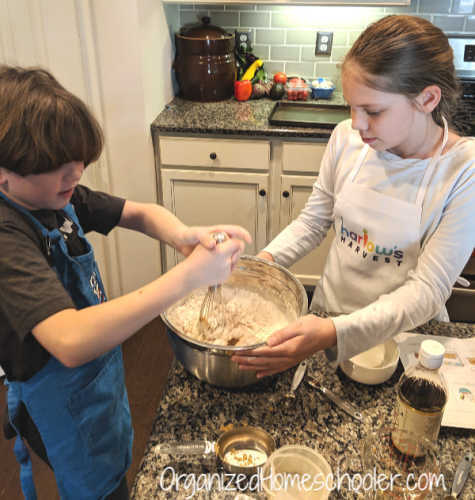 It would have been very easy to use a gluten-free all purpose flour in the recipe, but I decided to let my children follow the recipe exactly as written. Next time we will make the swap. They again worked together to prepare the pizza dough. It was really easy. So easy that they might just start making homemade pizza as a regular part of our meal rotation. I will happily hand over the dinner prep role one night a week. 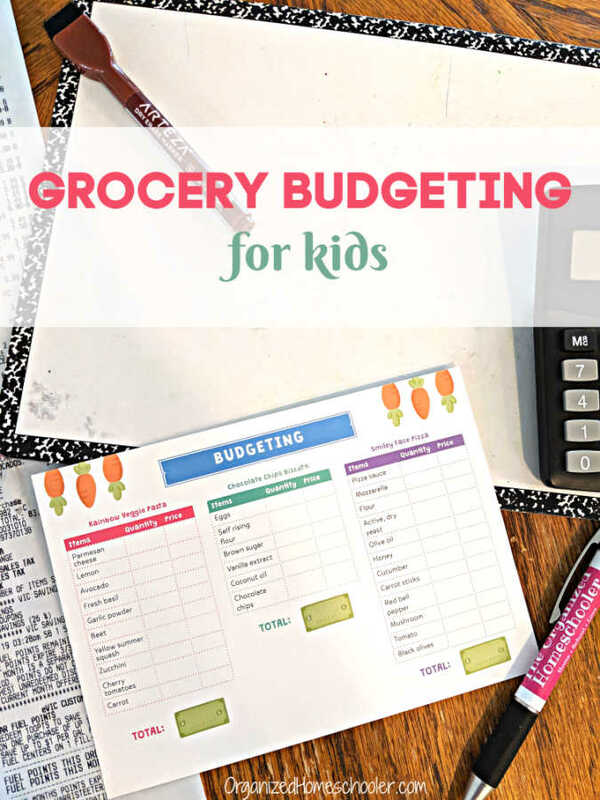 While the pizza was in the oven we sat down with the budget card, grocery store receipt, and a calculator to figure out the cost for each recipe. This was a fantastic way to incorporate real life math skills to our cooking lesson. The budget card is one of my favorite features of Harlow’s Harvest. Once the pizza was out of the oven we used the pizza cutting tool to slice up the personal pizzas. I was really amazed at how well this small plastic pizza cutter worked. It is kid-sized, but is definitely a real kitchen tool. I have found myself grabbing this pizza cutter out of the drawer instead of our expensive name brand cutter. It just works so well! 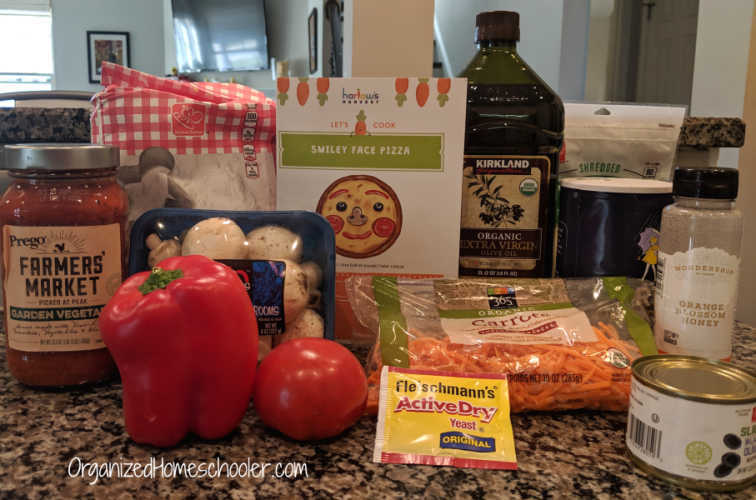 Did Harlow’s Harvest really teach my kids to cook? My kids have more confidence in the kitchen now that they have successfully followed several recipe cards from start to finish without adult help. They have always had access to my cookbooks, but my kids found them intimidating. Having a small collection of recipe cards just for them made learning to cook less scary. My kids seemed to enjoy working together on the task of learning to cook. They took turns measuring and stirring all of the ingredients. Our kit included one cute Harlow’s Harvest apron and pizza pin. 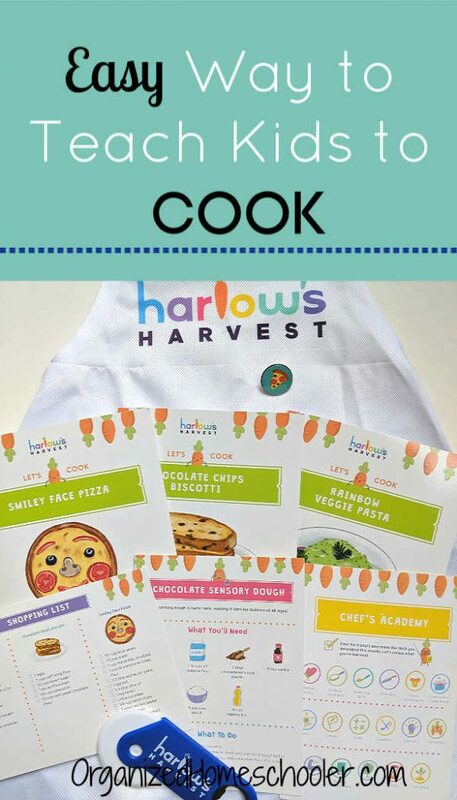 My son already had an apron he likes to wear when helping in the kitchen, but Harlow’s Harvest does offer the option to purchase an additional apron and a sibling kit with an extra pin when checking out. 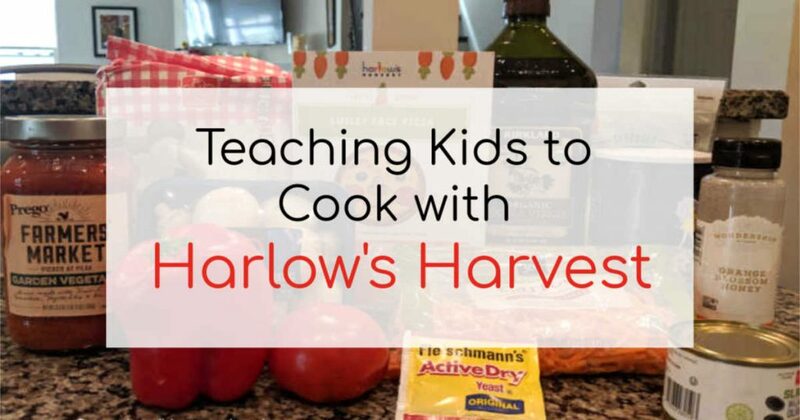 I was really impressed at how easily Harlow’s Harvest taught my kids to cook. The recipes were things they wanted to eat and the steps were easy to follow. We put the sturdy recipe cards next to my cookbook collection so the kids know where to find them when they feel like cooking. Harlow’s Harvest is offering one kit to a lucky winner! Enter the giveaway and share it with your friends. 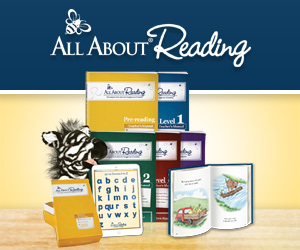 Harlow’s Harvest is also offering a coupon code to all blog readers. 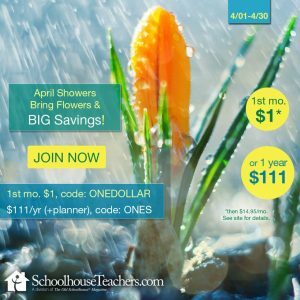 Use the coupon code: TG20 to receive one free monthly kit when you order a 6 or 12 month subscription.